Kelly has visited Tahiti five times. Picture courtesy of Rex images. 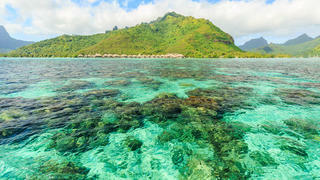 Tahiti is one of the most beautiful destinations to visit by superyacht. Picture courtesy of Shutterstock.com. I first went to Tahiti 15 years ago and have been back about five times since. You can just sail for days going from atoll to atoll. Fakarava was one of my favourite places, in the middle of nowhere. Very magical. It’s very remote so you eat only on board.